...Is Doug's journal, full of sound and fury, signifying nothing, plus some gratuitous references to himself in the third person. A couple pictures from a quick hike up Green Mountain this morning. 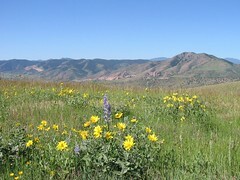 New wildflowers every week! It's getting hot, though. Oh, there's another picture of a bee, too (click through for the rest of the pictures).